With investigators from the Ombudsman’s office busy gathering facts about the shooting of Marc Ringland to pass on to the Public Prosecution Service, it seems the union representing police officers was happy to express its views on the incident. A front page article in the February issue of PoliceBeat mentions the actions of the off-duty officer who fired the fatal shot at Marc Ringland. Under the headline: “BOARD SHOOTS ITSELF IN THE FOOT…” there’s a photograph of a man blindfolded with the words “HUMAN RIGHTS…” written on the blindfold. This is the federation lambasting the Policing Board’s record on human rights as being one sided and neglectful of serving police officers. Then after citing a number of examples of what the Federation regards as policing board failures on the human rights of officers, it makes a reference to the most recent shooting incident in which Marc Ringland died. The family of the dead man found this comment disturbing. They viewed it as taking a stance to vindicate the police officer. Family solicitor Denis Moloney was similarly unimpressed and has written to the Police Federation seeking clarification. The Federation had more to say about the consequences of Marc Ringland’s shooting. The article then criticises two named members of the Policing Board before continuing: “As for the media and much of the general public, they should note that such is the dissident threat police officers carry their personal weapons for their self protection. Secondly, too many people have seen Western cowboy movies and expect officers to disable attackers with miraculour shots to the leg or arm or, even more fancifully, to graze the attacker’s head so that he falls conveniently unconscious. “The Policing Board should consider adopting a policy of letting only the Chairman speak for the Board – giving a lead to the public with a coherent and reasoned corporate view instead of the present undignified and relentless pursuit of media opportunities by the political members. I asked the Police Federation for an interview but whilst their spokesperson staunchly defended their right to state factually the obligations placed on a serving police officer, no one was prepared to be interviewed. This was the kind of commentary surrounding speculation about the manner of Marc Ringland’s death that, at the very least, according to the Ringland family lacked any sensitivity at all and appeared only to confirm in their minds the kind of bias that was meant to make it easy to justify the killing of their loved one. But aside from questioning the timing of the Police Federation article, the Ringland family and Denis Moloney view with suspicion the quickly disseminated details about Marc’s criminal record. Media coverage of Marc Ringland’s death caused pain for the family. They clearly viewed the varying stories with bewilderment. There were conflicting versions of events at the filling station shop. Media outlets offered differing accounts. 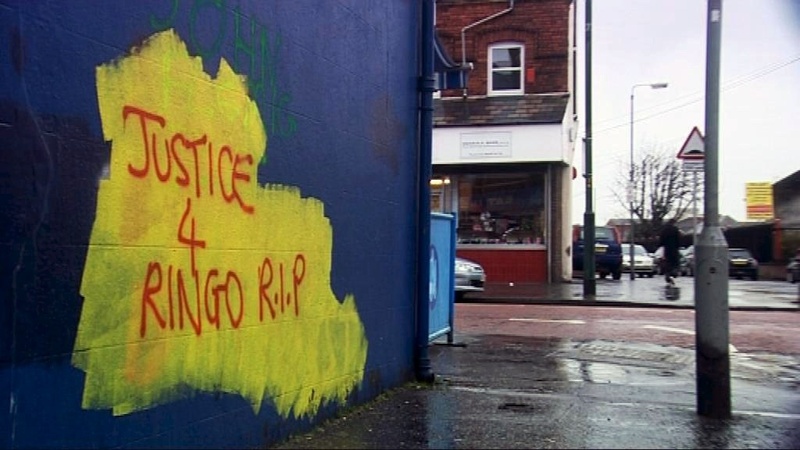 One newspaper quoted ‘police sources’ as stating that Marc Ringland was killed after lunging at the policeman with his weapon. This after an eyewitness informed the paper that Marc Ringland was holding a knife to the throat of a male shop assistant when the officer fired after repeated calls to drop the weapon. Another account claimed the robber was shot leaving the shop. Whatever the stories, the accumulative effect was to accentuate Marc Ringland’s criminal background by way of providing justification for the shooting. At least that’s how the family and their legal representative felt. On the night of the shooting, UUP councillor Michael Copeland was on the scene. He was interviewed by television and newspaper journalists. When we interviewed Mr Copeland, he recognised that his comments had the capability of causing distress to the Ringland family…but he denied he meant them as justification for the police officer shooting him to death. East Belfast MLA Robin Newton of the DUP said his son had worked at the filling station some years ago and had witnessed first hand an armed robbery whilst on duty there. “That kind of traumatic experience stayed with him for a very long time,” Mr Newton told the Detail.